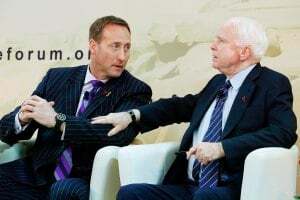 The relations between the Government of Canada and U.S. warmonger Senator John McCain are indicative of the subservient relations with the U.S. imperialists that the Harper government imposes on Canada, and what to expect from this year’s Halifax war conference. On June 18, 2013 then Defence Minister Peter MacKay went to Washington, DC to consult with his new master, U.S. Defense Secretary Chuck Hagel. News agencies carried brief reports that the topics included Canada’s participation in Obama’s Asia Pivot strategy and the continued deployment of Canadian warships and aircraft to the Caribbean and off the Pacific coast of Central America. MacKay reaffirmed this commitment in a keynote address to the Inter-American Defense Board of the Organization of American States, also meeting in Washington that same day. The Defence Minister also used the visit to bestow an honorary doctorate of military science from the Royal Military College (RMC) on ignorant warmonger U.S. Sen. John McCain at a small ceremony held at the Canadian embassy. MacKay, in his formal capacity as Defence Minister, was Chancellor of RMC. Both individuals were adorned in multi-coloured academic raiment. Dr. Joel Sokolsky, RMC Principal and a theorist of “interoperability” or military integration with the U.S. armed forces, and Major Ray Stouffer, Registrar, added lustre to a ceremony so outrageous that it was deliberately not held at the host institution, which is the norm when awarding honorary degrees. Doctor of Law is an honorary and esteemed academic title. It can never be bestowed on demagogues and criminals who prepare war and intervention in violation of international law and be justified. Nobody having an ounce of self-esteem, conscience and culture would commit such a serious lapse in ethics. Military science is a dedicated and disciplined field of enquiry, the theory and practice of enhancing military capability in conformity with the defence needs of one’s nation. No legitimate national defence college motivated by the ethics and ideals of defending the sovereignty and territory of one’s homeland would honour the proponent of naked aggression and the use of military force as the method to solve conflicts between countries and peoples. Not only is McCain an ignorant man, he has made zero contribution even in terms of U.S. imperialist military science or pseudo-science, from military education to combat capability, let alone strategy and tactics. What can Canadians possibly expect from such a “dedicated” advisor and such “a great friend to Canada”? With respect to Canada, McCain has attacked the health care system, commented that Obama should not be campaigning in a bus made “partly” in Canada, and said that the 9/11 terrorists came from Canada. He would reinforce security on United States borders, not just for the entry and exit of people, but also for the products that enter the country. He thinks that immigrants must speak English. He promised to reduce dependence on foreign energy. He is in favour of the death penalty, the growth and build-up of the armed forces, and the expansion of the Free Trade Agreements. 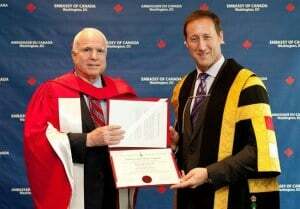 Politically, McCain, cast in the glorious robes from the Canadian military academy of the “noble struggle for freedom” and for “international security,” even used the occasion of receiving his illegitimate doctorate to advocate war, subversion, and even more atrocities for the long-suffering peoples of the Middle East. According to a Canadian Press report, “McCain says military intervention in the Syrian conflict is necessary,” thereby declaring the naked feudal philosophy of his empire that Might Makes Right in its attempt to make us believe in its “democratic,” “pacific,” “altruistic” and “honest” nature. Regarding Canadian defence ministers and military scientists and their relation to the U.S.? It is well known that “an apple never falls far from the tree.” This was reflected in the marching orders given to MacKay by U.S. Defense Secretary Hagel and the Harper government’s strident warmongering during the Syria crisis over chemical weapons later in the summer. Canada’s new Minister of State for Foreign Affairs Lynne Yelich announced on July 18 that it would be directly funding the International Republican Institute (IRI) through the approved budgets for the Canadian Department of Foreign Affairs and the Global Peace and Security Fund, specifically for one of two projects in the Middle East and North Africa aimed at organizing electoral coups. The combined cost of the two projects was $971,200. McCain is Chairman of the IRI Board of Directors, which is itself filled with other Republican Party operatives, many of them former state and government officials, as well as representatives of big U.S. monopolies. Much of IRI’s funding comes from the U.S. State Department, U.S. Agency for International Development (USAID) and the National Endowment for Democracy (NED) both part of the U.S. government’s plans for aggression, war and regime change worldwide. In other words, the Harper government now provides straight payouts in the millions of dollars to the U.S. agencies of “democracy promotion,” such as the IRI. The IRI, operating under NED and USAID, coordinates financial support to political parties and NGOs involved that undermine national interests in favour of U.S. interests – in violation of international law – in Latin America, the Middle East, Central Asia and elsewhere. For example, McCain has classified Venezuela as an enemy of the United States, vilifying the late President Hugo Chávez as a dictator. The IRI, under the leadership of McCain, funds and trains several opposition groups in Venezuela, mainly the neoconservative party Primero Justicia Un Nuevo Tiempo. The IRI is also one of the main funders of the different organizations and shock groups involved in the colour revolutions in Ukraine, Georgia, Serbia, Belarus, Iran and other countries. The IRI also financed the executors of the coup d’état against President Aristide in Haiti in 2004. In March 2005 McCain introduced a bill entitled “Advance Democracy Act of 2005,” authorizing funds, reinforcing subversion, establishing new structures and proposing additional mechanisms to exert pressure on Cuba. 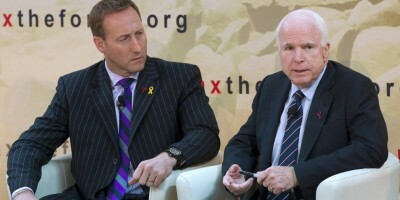 For the 2013 Halifax war conference, MacKay dutifully formalized Hagel and McCain’s attendance as lead speakers. The HISF itself operates from a Washington-based office funded with over $7 million Canadian tax dollars supplied by the Department of National Defence in a straight payout to the U.S.
For the past four years, McCain has been the HISF’s most vitriolic advocate of the global “war against terrorism.” As co-leader of the U.S. Congressional delegation, the senator is given pride of place during the opening ceremonies of the forum to speak, following on the heels of the U.S. defence secretaries. Each November for the past four years McCain has used Canadian territory to call for an invasion against Iran and Libya and military aggression against Syria, Venezuela and Bolivia, etc. The Doctor of War and Military Science shone in his participation at the 2011 HISF when he was the first U.S. state official to issue a public call (on November 19) for formal recognition of the Syrian National Council (SNC) and its proxy army of mercenaries and jihadists as the official U.S.-NATO instrument for destabilizing Syria. McCain – who was the Godfather of the Ahmad Chalabi’s Iraqi National Congress – now serves as the Godfather of the SNC. At the 2010 Halifax war conference he and fellow U.S. Senator Lindsey Graham openly called for the “neutering” of Iran. In 2009 McCain insisted that the Iraqi surge can be replicated in Afghanistan and that within the next year to 18 months, “We can turn the situation around.” Time has issued the verdict on that boast. John McCain is no friend of the Canadian people who hold him in the greatest contempt. The presence of this war criminal at the Halifax International Security Forum will surely be vigorously condemned. Not In Our Name! War Criminals Out of Canada!